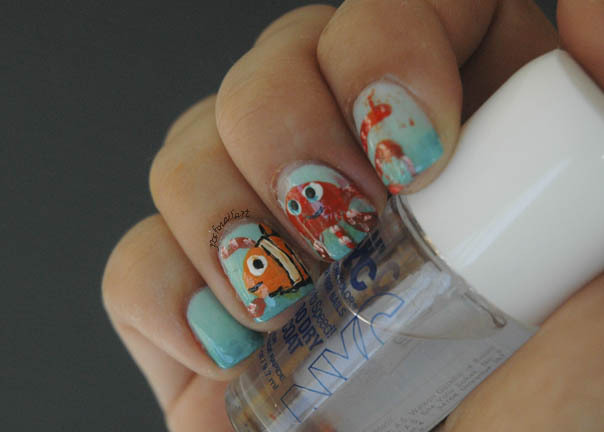 Hi everyone, this is Aylin from Posh Nail Art! A lot of new movies are coming to cinemas lately, and as you may already know, animations are my first choice. 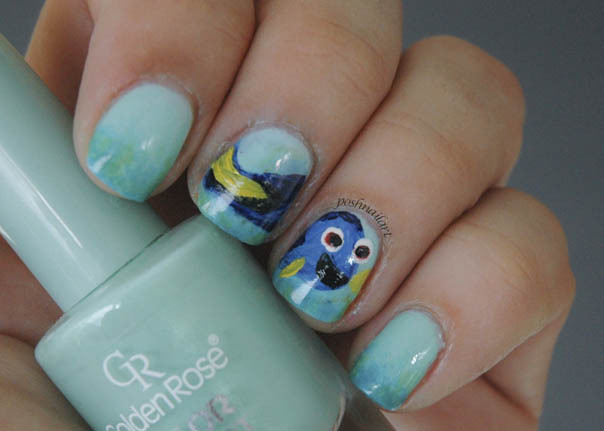 So this month, I wanted to make some Finding Dory nails! To draw Dory, I made a big blue blob with paint and added the tail, fins and other details with a thin brush. If your thinnest brush isn’t still thin enough for you, here’s a tip; you can trim a few bristles off to make it thinner. On my other hand, I drew Marlin and Hank the Octopus. Again, I used acrylic paints and thin brushes for the nail art. For Marlin, I started with an orange oval shape and added the black & white stripes later. Add eyes with a dotting tool. For Hank, I started with a red-orange round shape and added the arms and tentacles. I wish my nails were a little longer so I could draw all of his arms, but this was all I could fit. 😀 Add the eyes with a dotting tool and finish with a topcoat. 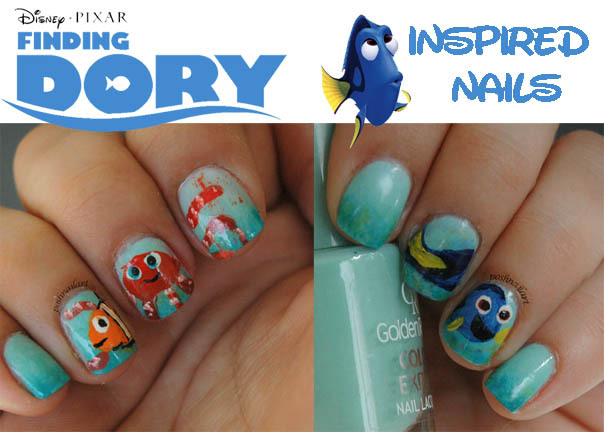 I really like wearing themed nail art for special events and I’ll be wearing this one when I watch Finding Dory. 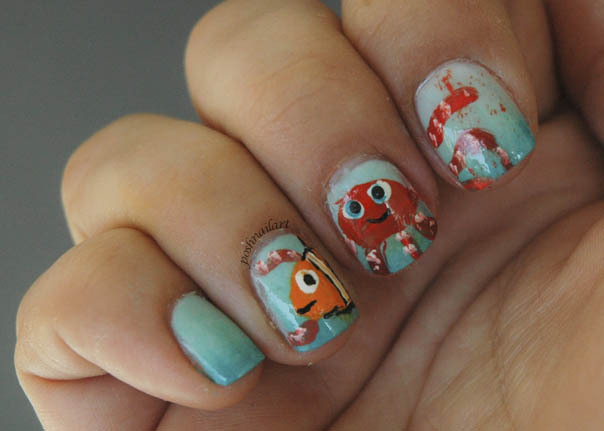 If you are anything like me, drop a line below to tell me which was your favorite animation movie and if you wore matching nails. See you next month. 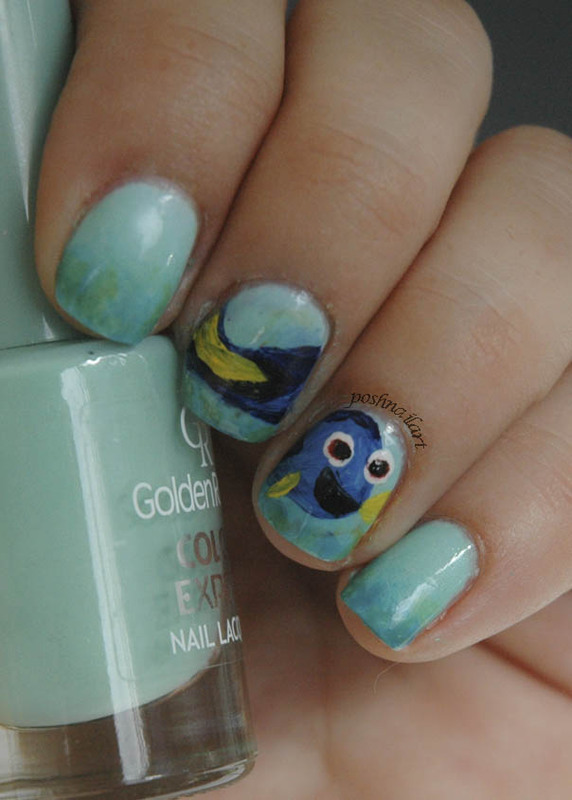 Untill then, plase check Posh Nail Art for more nail art ideas.